Ukraine’s largest carrier Aerosvit has entered a period of restructuring after filing for bankruptcy on 28-Dec-2012. At the core of the airline’s reorganisation is a large network shake-up which will see rival Ukrainian carrier Ukraine International Airlines (UIA) take over nearly its entire international network. While UIA stands to benefit significantly, adding at least 30 routes, Aerosvit’s operations will significantly reduce in size. If it survives the bankruptcy, Aerosvit will be left as primarily, or perhaps entirely, a domestic operator. Aerosvit hopes to continue operating during its reorganisation, which is aimed at restoring the airline’s operational efficiency and improving profitability, and retain five medium-haul and five-long haul international routes. But the airline’s ongoing operations have been disrupted with incidents involving its aircraft being impounded at various airports causing issues across its network. Aerosvit’s financial difficulties are substantial, with the airline owing UAH4.27 billion (EUR403 million) to its creditors as of 27-Dec-2012. The airline’s total assets amounted to UAH1.47 billion (EUR138.7 million) as at 30-Sep-2012. Aerosvit pursued rapid expansion in 2012, launching several new routes and significantly increasing total capacity. The expansion proved too ambitious, impacting the carrier’s financial position. Just prior to the bankruptcy filing, Aerosvit unveiled plans to transfer a large number of its international routes to UIA, the second largest carrier in the Ukraine. It initially identified 24 routes that would be transferred to UIA from the beginning of the northern hemisphere summer 2013 schedule at the end of Mar-2013. UIA has since unveiled plans to take over another six former Aerosvit routes in Jan-2013 and Feb-2013. In recent weeks UIA has already been picking up thousands of stranded Aerosvit passengers. These route transfers will see Aerosvit lose prime position in the Ukrainian market and become the second largest carrier in the country. Aerosvit was already the second largest international carrier at Ukraine’s capital airport, Kiev Boryspil Airport, but will now fall much further behind UIA. The largest foreign carrier at Kiev, Aeroflot, and small local low-cost carrier Wizz Air Ukraine also stand to benefit from Aerosvit’s woes. UIA’s international network will significantly expand as routes are transferred, with its Eastern European network to see the most significant boost. In recent years, Aerosvit has focused primarily on Eastern Europe while UIA has focused more on Western Europe. Most of the routes being transferred at the end of Mar-2013 are to Eastern European destinations not currently served by UIA. The two Western Europe destinations to be transferred, Copenhagen and Stockholm, are also not served by UIA. Among the destinations in the initial transfer list only Tel Aviv is served by both carriers but the routes being transferred are from cities other than Kiev that only Aerosvit now operates. Note: Dnipropetrovsk International Airport; TLV = Tel Aviv-Yafo Ben Gurion International Airport; DOK = Donetsk International Airport; KBP = Kiev Boryspil International Airport; AER = Sochi International Airport; ARN = Stockholm Arlanda Airport; ATH = Athens International Airport; BUS = Batumi International Airport; CPH = Copenhagen Airport; FRU = Bishkek Airport; SVX = Yekaterinburg Koltsovo Airport; KGD = Kaliningrad Khrabrovo Airport; KGF = Karaganda Airport; KRR = Krasnodar Pashkovsky Airport; KSN = Kostanay Airport; LCA = Larnaca Airport; MUC = Munich Airport; NJC = Nizhnevartovsk Airport; OVB = Novosibirsk Tolmachevo Airport; PRG = Prague Ruzyne Airport; ROV = Rostov Airport; SKG = Thessaloniki Makedonia Airport; VNO = Vilnius International Airport; WAW = Warsaw Frederic Chopin Airport; EVN = Yerevan Zvartnots International Airport; ODS = Odessa International Airport. In addition, UIA will take over on 15-Jan-2013 UIA’s routes from Kiev to Astana, Minsk and Tbilisi. UIA also has unveiled plans to take over Kiev-Baku services on 12-Feb-2013 and to take over the Kiev-Yerevan route on 13-Feb-2013, instead of 31-Mar-2013 as originally planned. Aerosvit and UIA also recently added to the list of routes to be transferred on 31-Mar-2013, Donetsk-Yerevan and Odessa-Yerevan. Astana, Baku, Minsk, Tbilisi and Yerevan are all in Central Asia, a region UIA already has a presence in and is keen to expand. UIA already served the Georgian capital Tbilisi and is increasing service on the Kiev-Tbilisi route from one daily to two daily flights as Aerosvit pulls out, according to Innovata data. UIA also already served Astana and Almaty in Kazakhstan and the addition of Karaganda and Kostanay will give it four destinations in the booming Central Asian country. While the two carriers have been competitors domestically, they have had limited overlap internationally in recent years. The primarily complementary networks allowed Aerosvit and UIA to codeshare and be partners while also competing in some markets. UIA has continued to codeshare with Aerosvit while most or all of Aerosvit's foreign carrier codeshare partners have stopped working with Aerosvit after it entered bankruptcy. Georgia and Kazakhstan were two markets where the two carriers overlapped and were competing fiercely. In the Ukraine-Kazakhstan market in particular there was over-capacity, leading both carriers to offer extremely low fares on sixth freedom one-stop routes to Europe via Kiev. With Aerosvit pulling out of Kazakhstan, capacity will be reduced to more rational levels. As a result Kazakhstan flag carrier Air Astana is now preparing to launch services to Kiev by Jun-2013 from both its Almaty and Astana hubs. Both routes are expected to be initially served by Air Astana with three weekly frequencies. Kiev has been a white spot in Air Astana’s fast-growing network in the Central Asia/CIS region but the carrier was not keen to enter the market previously due to the intense competition between Aerosvit and UIA. According to Innovata data, currently Aerosvit and UIA both still serve Moscow and Tel Aviv. But Aerosvit is handing all of its Tel Aviv routes to UIA on 31-Mar-2013. At least for now it does not plan to pull out of Moscow but Kiev-Moscow is a big market and the Ukrainian carriers serve different airports with Aerosvit at Sheremetyevo and UIA at Domodedovo. Aerosvit recently announced its plans to continue serving Moscow along with three other medium-haul destinations – Saint Petersburg, Istanbul Ataturk and Tashkent in Uzbekistan. Aerosvit serves all four destinations from Kiev and also serves Istanbul from Odessa. UIA currently does not serve Saint Petersburg, Istanbul or Tashkent. But as UIA rapidly grows its European and Central Asian networks, the carrier will likely be keen to serve these rather large destinations. Aerosvit also has said it plans to continue serving five long-haul destinations: Bangkok Suvarnabhumi, Beijing, Goa, Ho Chi Minh City and New York John F Kennedy. Of the 10 international routes being retained, five now appear on the airline’s top 10 international routes based on seats per week – Kiev Boryspil to Moscow Sheremetyevo, Bangkok Suvarnabhumi, New York John F Kennedy, Saint Petersburg and Istanbul Ataturk. UIA currently does not operate any long-haul routes but had been planning to expand into the Far East market in 2013 and add widebody aircraft. UIA had targeted Bangkok and Beijing, two of Aerosvit’s most lucrative routes, as its first widebody destinations. It appears UIA is moving forward with these plans as the carrier reportedly has acquired five 777s for delivery starting in Mar-2013. The 767s Aerosvit now uses for its long-haul network are reportedly being returned. As Aerosvit could have a hard time acquiring alternative widebody aircraft while in bankruptcy, it seems UIA will likely end up as the only Ukrainian carrier on the Bangkok and Beijing routes as well as potentially on other Aerosvit long-haul routes. UIA needs to expand its network in Asia to balance out its global network, which is focused on Europe, and meet its goal of expanding its east-west sixth freedom traffic. About 30% of UIA's traffic is now transit. As the carrier rapidly expands in Eastern Europe it will need to pursue similar growth in Central Asia and the Far East. With the 30 additional short and medium-haul international routes, UIA’s narrowbody fleet will also need to be boosted. UIA currently operates a fleet of about 20 Boeing 737s, which includes a mix of classic and next-generation variants. The carrier has already announced it has leased two additional ex-Aerosvit 737-800s, which joined the carrier's fleet on 11-Jan-2013 and 14-Jan-2013. 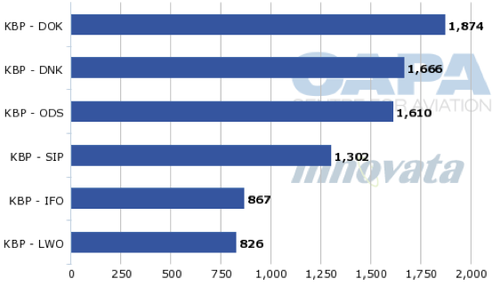 UIA says it plans to add two more 737-800s in Apr/May-2013, giving it a total of 23 737s. UIA will likely need more narrowbody aircraft as it continues to quickly grow its international network to fill the void left by Aerosvit. UIA could potentially take over more leases from Aerosvit. The two carriers have compatible fleets, with Aerosvit having operated a fleet of about 30 aircraft which also mainly consist of 737 variants. While UIA will become by far the largest international carrier in the Ukraine, the two carriers will remain big competitors domestically. Aerosvit is currently the largest domestic carrier in the Ukraine with almost 51% of capacity. This is followed by UIA with approximately 44% and Motor-Sich with around 5%. 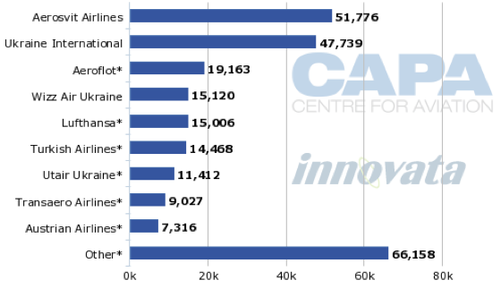 According to Innovata, approximately 79% of UIA’s capacity is currently allocated to international routes. It is currently strongest in Western Europe, where Aerosvit has a limited presence. Aerosvit, post-restructuring, plans to focus on operating domestically in the Ukraine while operating a heavily reduced international network. 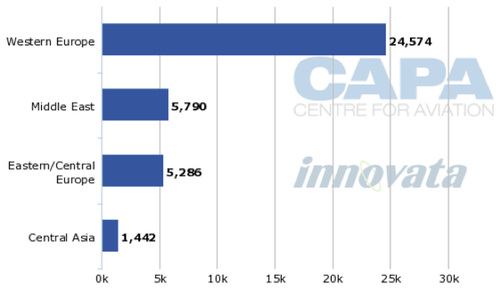 Based on its schedules filed for the week commencing 07-Jan-2013, approximately 84% of the airline’s seat capacity is international while around 16% is domestic, according to Innovata. 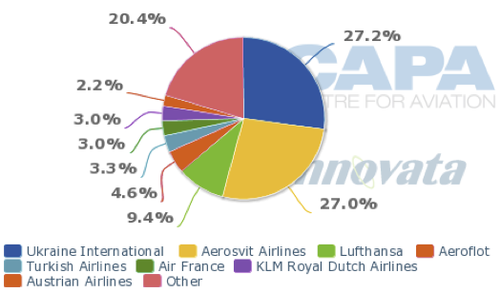 Aerosvit’s international network, as of 07-Jan-2013, was dominated by Eastern European routes. Approximately 64% of its seat capacity allocated to markets in Eastern Europe, followed by the Middle East and Southeast Asia with 12% and 10%, respectively. Aerosvit’s domestic Ukrainian network consists of six routes, from Kiev Boryspil to Donetsk, Dnipropetrovsk, Odessa, Simferopol, Ivano-Frankivsk and Lviv Snilow. Aerosvit currently competes with UIA on all the routes with the exception of the Kiev Boryspil-Ivano-Frankivsk service. Note: KBP = Kiev Boryspil Airport; DOK = Donetsk International Airport; DNK = Dnipropetrovsk International Airport; ODS = Odessa International Airport; SIP = Simferopol International Airport; IFO = Ivano-Frankivsk International Airport; LWO = Lviv Snilow International Airport. While a relatively large country (both in land mass and population – it has about 45 million people), the Ukrainian market (like many other markets in Eastern Europe) cannot easily sustain two large flag carriers, particularly as low-cost competition continues to increase. 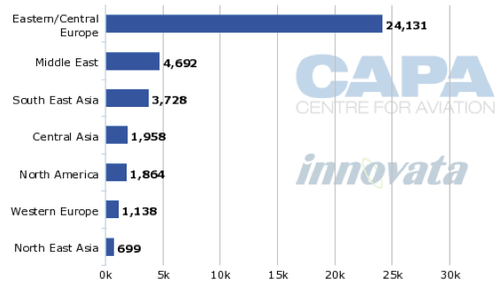 LCCs currently account for around 14% of Ukraine’s system capacity, according to Innovata data. Wizz Air Ukraine, the Ukrainian division of Hungarian Wizz Air, is the leading budget carrier in the Ukrainian market. But it has struggled to gain a significant foothold in the Ukrainian market since launching services in 2008. Aerosvit's woes could give the carrier an opportunity to expand. Wizz Air Ukraine currently only operates 13 low-frequency routes and accounts for about 6% of total capacity in the country, according to Innovata data. Wizz Air initially had high expectations for penetrating the domestic Ukrainian market but in its early days the carrier was not able to overcome stiff competition with UIA and Aerosvit. It currently only serves one domestic route. Several foreign LCCs also serve the Ukraine, including Turkey’s Pegasus, UAE’s Air Arabia and Flydubai, Latvia’s airBaltic, Hungary’s Wizz Air, Italy’s Air One Smart Carrier and Norway’s Norwegian Air Shuttle. The presence of low-cost carriers is likely to continue to grow and pressure existing legacy carriers including Aerosvit and UIA as has been seen across Europe and the rest of the world. The needs of the Ukrainian market could potentially be met by one strong full-service carrier along with LCCs and smaller regional operators. As a much smaller carrier, Aerosvit could struggle to compete and complete its attempted restructuring. There are several other smaller Ukrainian airlines currently operating across the country which would be ready to fill Aerosvit's domestic void if needed. If Aerosvit’s restructuring is a success, it will be a much smaller airline in the future with a much more focused route network, concentrating on domestic Ukrainian services and possibly a small number of international services to proven markets. UIA will be the biggest winner out of this situation and will become Ukraine’s largest airline and main flag carrier. Having one major full-service player instead of two will improve UIA's outlook significantly and its new significantly expanded network will help position the carrier to pursue more transit traffic as well as pursue more partnerships with foreign carriers and potentially membership in a global alliance.